What an auspicious day to awaken to. In the morning, my parents reminded me, “Don’t forget you must fast today. 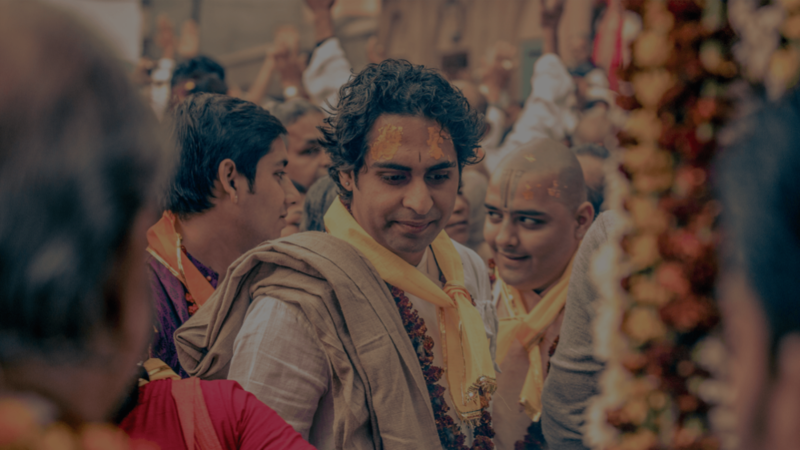 Please go and get ready for Radharamanji’s bathing ceremony (abhishek).” I started my day with an inner smile in my heart, filled with the anticipation of meeting my Radharaman. I followed the usual customs before serving my Lord. I bathed, wore a new thread and new clothes. 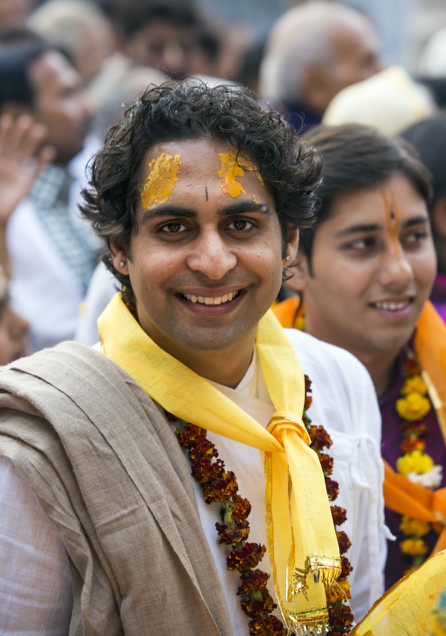 My entire family was busy hosting devotees; my home was full of our disciples. I made a polite exit and reached the temple. Washing my feet, hands and mouth again, I drank charanamrit before making my way to the altar. Thinking that soon my eyes will worship my Lord made my heart beat so fast. Many devotees had already gathered at the temple courtyard. There was an electric ambience of excitement in the air as they took darshan of Radharamanji, Who was already standing on the special abhishek throne. He looked so royal, with His white dhoti, and that naughty smile resting across His adorable cheeks; that smile which illuminates everyone’s hearts! 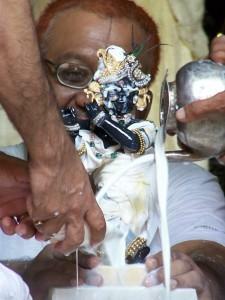 Soon after, my father started the rituals before the abhishek. I washed my hands once again, rubbed fragrant oil on my hand, paid obeisances to Shriji with my entire body and touched His lotus feet. It was a beautiful feeling. All the hairs on my body were standing on end. My father has asked me to commence the abhishek of Shriji in the presence of hundreds of devotees. In the months leading up to Radharamanji’s appearance day, I had been suffering from serious back pain. I could not take part in the Gaur Purnima abhishek at the Amiya Nimai Temple earlier this year. By the loving grace of Shriji, I managed to perform His abhishek for four hours continuously. Over 800 litres of milk were used in the bathing ritual. And even afterwards, I was not in any pain. I was not sure if I was feeling shocked or if I should even be surprised at what just happened. What blessings and wonderful mercy! On His appearance day, I wanted to serve Him, but Radharamanji gave me the generous gift of fulfilling all of my desires by giving me the shelter of His Lotus feet. A very happy birthday to the Fulfiller of my soul’s innermost desires. Jai Radharaman!